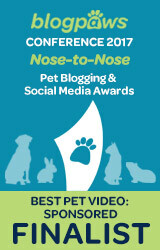 Over at BlogPaws, I'm a Community Member as well as a Pet Blogger Influencer. 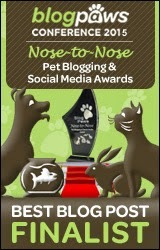 Each month, BlogPaws has a special theme. For April, their theme is Small Pets. If you didn't know already I am a huge small and exotic pet lover. You could say that small pets are kind of my passion. Because a lot of these animals aren't as popular as dogs or cats, I don't write about them as much. You'll probably be subjected to a few more than usual small and exotic pets posts this month for Small Pets Month. To start things off, let's have some fun! 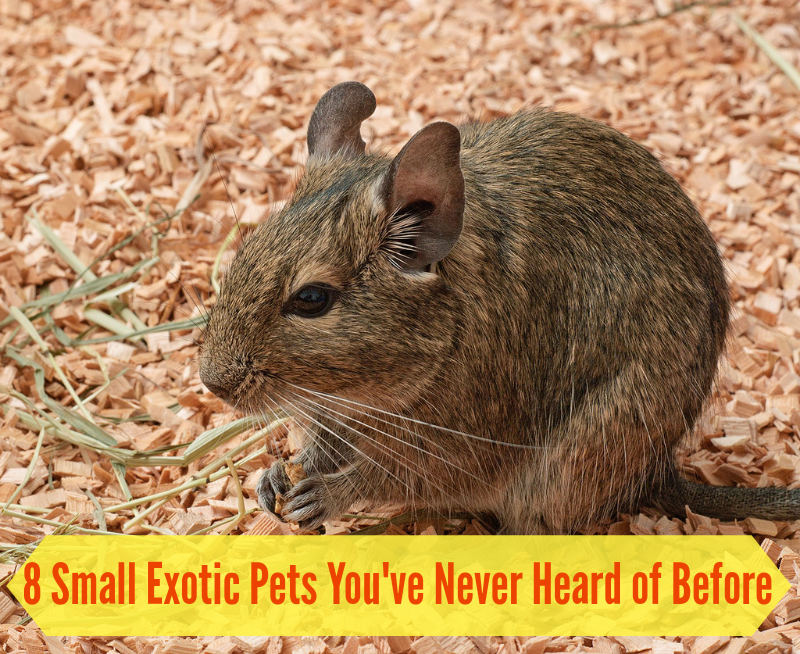 Here's a list of 8 small exotic pets you may have never heard of before. 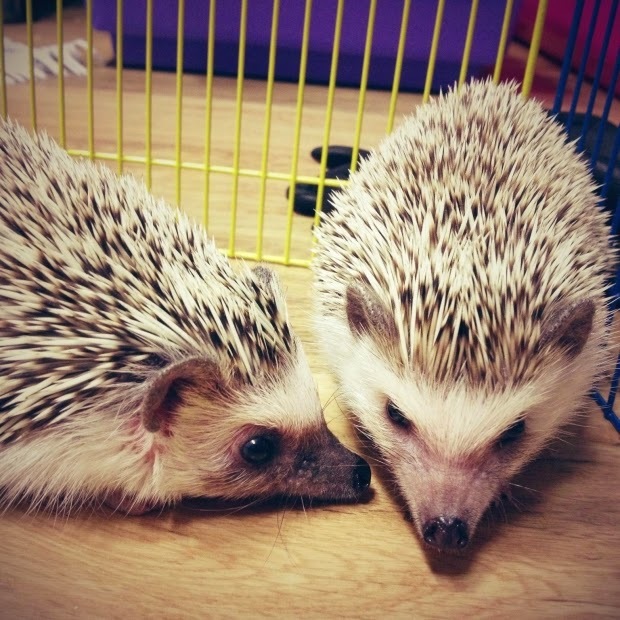 African Pygmy Hedgehogs are very popular pets. Yes, they do have quills but with a little practice they are easy to handle and hold. They are mostly nocturnal animals, which means they'll be most active during the night. As cute as they are, they are still illegal in a few states. You'll want to check your state's laws before considering keeping one as a pet. Sugar Gliders are very small marsupials that can easily fit in the palm of your hand. They are kind of like a miniature flying squirrel. Sort of. Popular because of their extra cute looks and how easily they bond with their owners. Sugar Gliders are also nocturnal animals, spending most of their time awake at night. Be committed because these guys have a lifespan of 12-15 years. I personally knew a 12 year old Sugar Glider named Taz. As cute as they may be, I will admit that I'm scared to death of them. They weren't too happy when getting their nails trimmed at the vet's office and they have some pretty intimidating teeth! Their long sharp teeth are used to chew through tough bark in order to reach sap to eat in the wild. 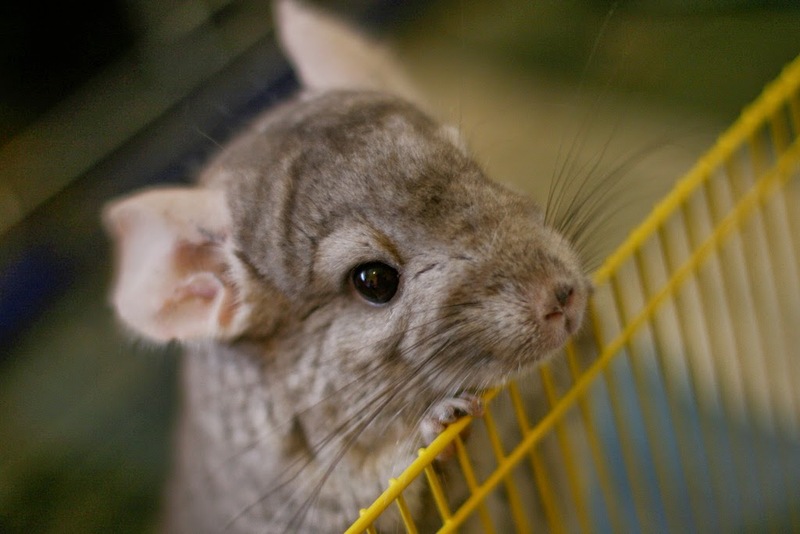 Chinchillas are native to the Andes Mountains in Chile. I recently published an article about how they take baths in dust. 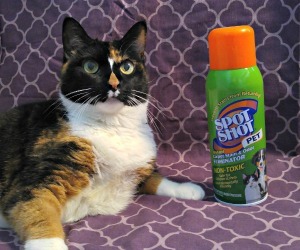 Known for their super soft fur makes them an unfortunate victim of the fur coat industry. 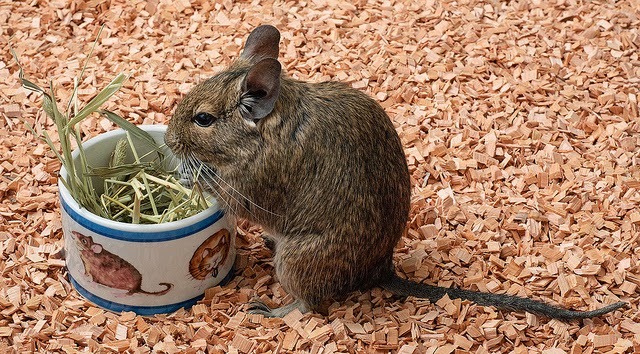 Chinchillas are rodents who eat a diet of mostly hay and some pellets. They are very fast critters and great jumpers. Again, be committed because a Chinchilla can live to be up to 20 years old! These lizards get their name for their beautiful spots all over their scaly bodies. One of the easiest and most popular lizards that are kept as pets, they are also relatively low maintenance as far as reptiles are concerned. They are native to Asia and live in the deserts there. Their diet consists of bugs like crickets and mealworms. Yum! These animals resemble cats but are not. The Spotted Genet is a carnivorous animal that comes out at night. They have very long tails and a beautiful spotted coat. They are native to Africa, Europe, and the Middle East. Genets are an animal I would actually discourage from keeping as a pet. I have met one before that a client purchased from a pet store. 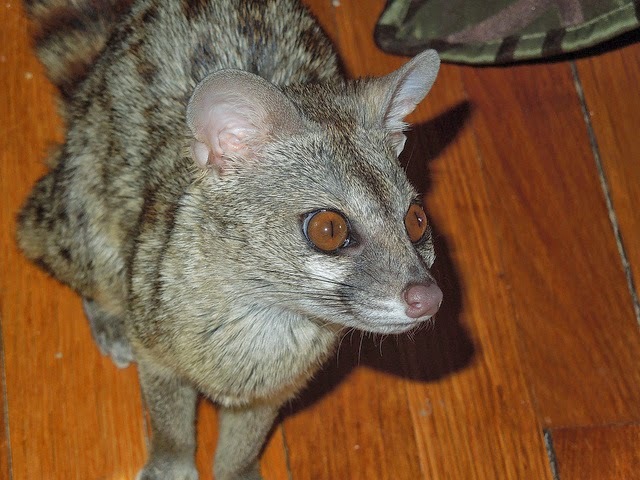 The Genet had an injured tail and needed to be anesthetized for several procedures. Let me just say that this was definitely a wild animal that I could never imagine being kept as a pet. But to each their own. Maybe there is someone out there with more experience keeping them. 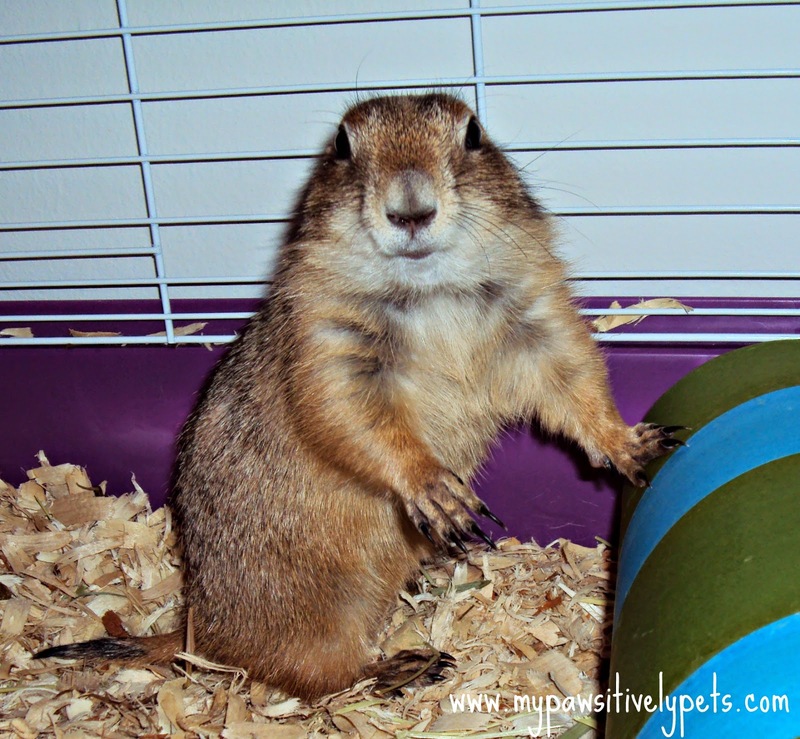 OK, so I'm sure you've all heard of Prairie Dogs before but did you know they are now fairly popular pets? I didn't know until a few years ago when Prairie Dogs were making their way to the vet clinic I worked at on a regular basis. These guys eat a diet of mostly hay and are very curious creatures. Again, I have to admit that they are a little scary to me. Most were not friendly at the vet's office, although their owners claimed they were so sweet at home. My brother actually had a Prairie Dog for a short period of time, but had to return it due to allergies. His Prairie Dog did seem pretty nice judging from the time I spent with it. While I have never personally met a Degu before, I would really like to. They kind of resemble a rat and a Chinchilla mixed together. These cute little rodents come from Chile and are related to guinea pigs and Chinchillas. 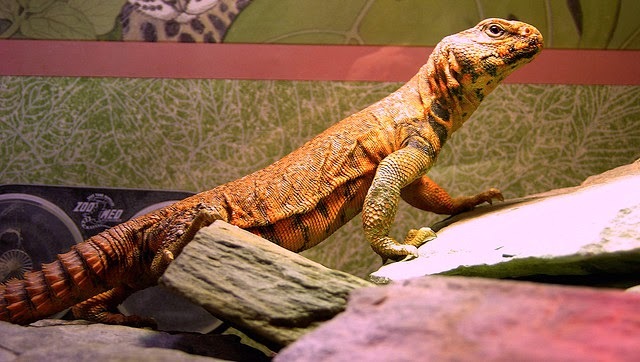 The Uromastyx is a lizard that comes from North Africa and the Middle East. They are mostly herbivores, meaning they eat plants, but will sometimes make a snack out of a bug or two. They enjoy basking in the warmth of the sun as many lizards and reptiles do. The cool thing I like about these lizards is how much they resemble a little dinosaur. I don't know what it is, but it's what I think of every time I see one. It must be their tail, which is spiky. What unusual small exotic pets would you have added to the list? Were there any here that you've never heard of before? Let us know in the comments! Gosh some of those we have never heard of before. The Sugar Gliders have the cutest eyes. Have a tremendous Thursday. One of my friends had a prairie dog in high school named Justin Timberlake, for obvious reasons (it was the 90s). He got out of his cage one night and scared everyone to death! Good ol' JT. WOW! There were actually three that I never ever heard of before, but I must agree with you "sugar gliders" scare me to death too. I am frightened to death of squirrels - don't know why, but it's really pitiful / comical to see me when I'm accidentally close to one. Shameful. Thanks for this post, I enjoyed it! Wow - I am also scared of squirrels! But only after handling a few at the clinic. You have good reason to be scared lol... those things can be crazy! I have always wanted a sugar glider! they are SO SO cool looking! I have seen hem once, a friend of a friend had a few, and they are the cutest little things!!!!! Hmmm, I have heard of most of those. A prairie dog though?? That would be weird. Those are all cuties and there were some we had never heard of before now. That Degu is soooo adorable!!! This was so much fun! I had never heard of the Degu, Uromastyx,Spotted Genet, Leopard Geckos, Sugar Gliders or the African Pygmy Hedgehog. I also never knew that people have Prairie Dogs as pets! I like the Degu too :) I totally want to meet one. Although they do remind me of gerbils, which I'm a little scared of for some reason. OMC - I've nevver heard of some of those and certainly never thought of a Prairie Dog being an indoor pet. They are all cuties tho. we never hurd oh de last lizard dood N we sure dinna noe ya could make a prairie dog inta a pet....we due knot think they wood like bein caged n like that.... ??? nibblet....hope ewe R feelin better N may bee a degu wood bee a fun friend !! I'm not really a fan of prairie dogs as pets. Nibblet is still sick unfortunately, but she thanks you! I have never heard of a Spotted Genet. They are quite cute. I love hedgehogs, and would maybe one day like to have one. Hedgies get the itchies a lot... I met one with only one eye once. He was pretty cool. Never heard of the Genet and Degu before! Your description of a couple of them remind me of people trying to make a pet out of a raccoon . Cute as all get out to look at, but that fluff covers mean, wildly instinctive streaks that I'd never want in my own house. We have friends that have Sugar Gliders and they love them. They scare me. Very informative article and they are all cute (except lizards) but I'm sticking with pups! Really enjoyed reading this post! 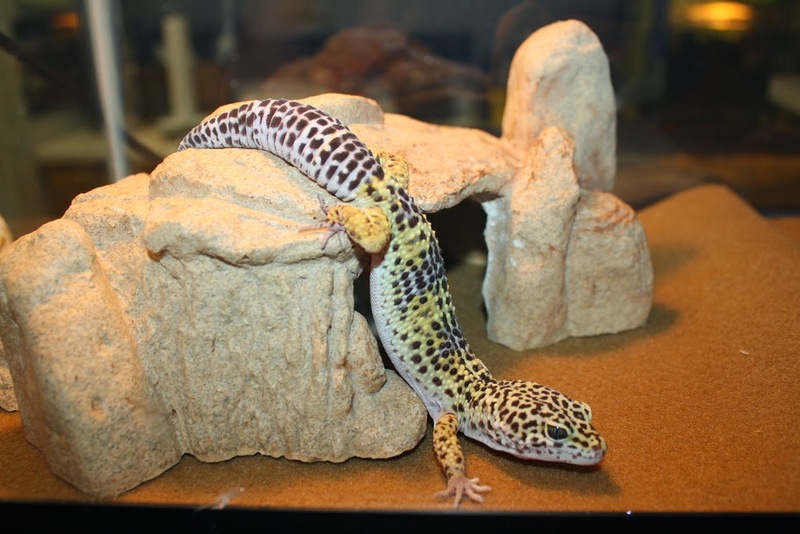 Some of these beautiful creatures I had not heard of...my husband would love to have a leopard gecko someday. It's also interesting to learn how long some of these pets live! So funny. I've been in contact with at least 3 of these little guys and had one as a pet myself. So fun to learn more about! We've adopted out sugar gliders and chinchillas (two chis just this week!) at our shelter. Way fun! Remind us to tell you someday of the Great Prarie Dog fiasco at the Kansas City Zoo. Or just google "dunmire" "zoo" and "prairie dog" - OY VEY! Lol... well I'll believe it! Fiasco sounds like the perfect word for a prairie dog... I've chased several around the exam room before. Some of those are so cute, but I definitely hadn't heard of all of them, nor would I want some of them as pets. I'm not a reptile person so I'd definitely pass on those, though they are pretty cool looking, from a distance, ha ha! I'm huge fan of chinchillas, they are so much fun to play with. The uromastyx seems interesting, I know little about those. Dave the Degu-very cute and smart, Flowers the skunk, very cuddly and soft, a Uromastyx feels rough, sugar gliders, and Prairie Dogs who are very curious and love to play as well as have their backs scratched. chinchillas, bunnies, Iguana, bearded dragon, Pionus parrot, and madagascar hissing cockroaches. I love Hedgehogs the most. Too bad because a lot of people don't know how adorable those cute little creatures actually are. 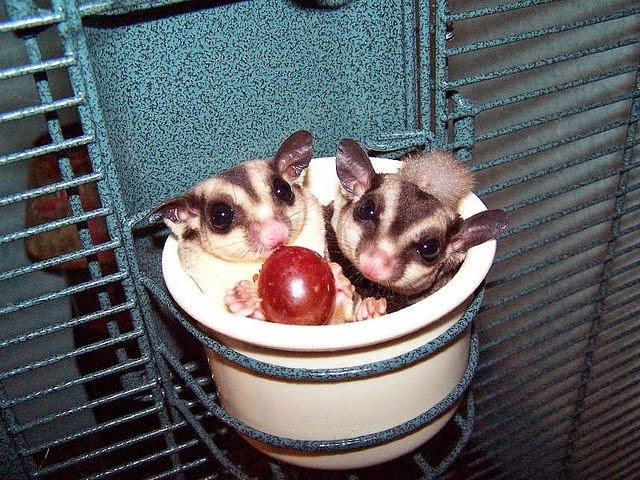 How cute the sugar gliders are! I can't wait to get my hands on one of them. I also love how long their life expectancy is. Maybe they aren't that small, but lately foxes have been all the rage. A farm in Russia did an experiment that lasted over a few decades and ended up with tame foxes... Some of their ears droop like a dog's and they wag their tails. Some people speculate that they may someday surpass cats and dogs as pets because they are 'like a wonderful mix of the two' as I have heard.